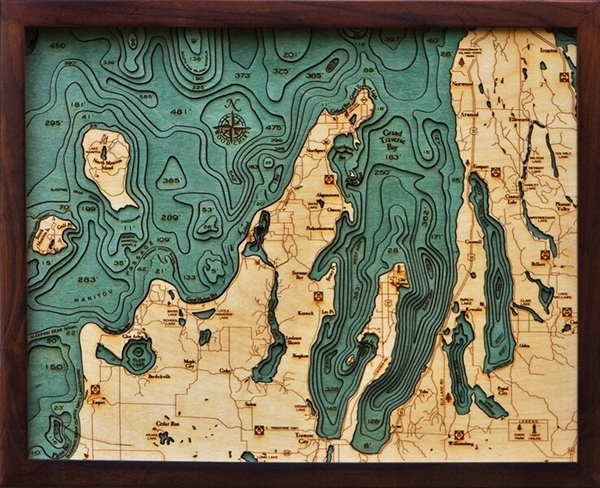 The Leelanau Peninsula in the northwestern area of Lower Peninsula of Michigan formed the Grand Traverse Bay. From its peak and in the tail part, it measures 32 miles (51 km) long, 10 mi (16km) wide. The deepest part of the bay measures around 620 feet (190 m). The Old Mission Peninsula divides the bay into two parts. Michigan is the main producer of cherries in the United States. Aside from these the surrounding countryside of the Grand Traverse Bay also produces grapes for Michigan’s wine business. The long stretch of sand means a number of great beaches offer various activities and a popular tourist destination. Grand Traverse Bay contains several smaller bays which surrounds the main bay. The best place to dock a boat is at the Northport Public Marina. The bay is one of the best places to go boating for an amazing Great Lake vacation. Grand Traverse is also famous for its golden sand beaches and pristine blue waters. Anglers can also enjoy the enormous quantities of fish in the bay. The size of Grand Traverse Bay offers an ideal way for boating and fishing. The great thing about the lake is that when fierce storms plagued the main lake, one can simply go fishing to smaller lakes nearby. The bay offers several surrounding beaches, from the famous tourist spot beaches down to the off beaten path. Here are the well-known beaches in the Grand Traverse Bay. - A few minutes away from Traverse City, the Bryant Part sits on the west side and a great way to see the sunset. - This beach offers activities such as kayaking, canoe rentals, and paddle boarding. - This beach is known for partying and socializing. It offers several activities including beach volleyballs, a grass field perfect for playing catch. - East Bay Park is the shallowest of all the beaches in Grand Traverse Bay. It also has a camping site and a playground for kids to enjoy. - The island is situated about 3.5 miles from Bowers Harbor on Old Mission Peninsula. It has wooded camping sites, hike trails and sandy beaches. - This beach is one of the off beaten tourist destination because people seldom go here. It’s perfect for undisturbed bonding moments with the family. - The famous Sleeping Bear Dunes makes the 40-minute trip from downtown Traverse City worth it. Sand dunes of 400 feet tall adorned the scenic view of the North Bar Lake.